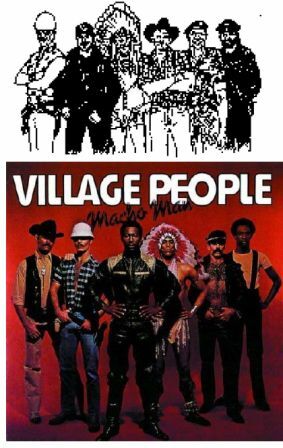 The wife and manager of Victor Willis, a former member of the disco group the Village People (yes, you read “wife” correctly, the Village People had at least one straight “macho man”), filed three petitions for cancellation of Can’t Stop Productions, Inc.’s (“CSP”) three trademark registrations, two for the word mark VILLAGE PEOPLE and one for the design mark shown to the right. CSP filed motions for summary judgment on Willis’ pleaded grounds of fraud, abandonment and genericness in each of the three cancellation proceedings, which the Trademark Trial & Appeal Board (“TTAB”) consolidate in its order because of the sufficient commonality of the factual and legal issues. Petitioner makes similar allegations regarding abandonment of all three of the registered marks, namely that since the 1980’s the marks have only been licensed for live performances and no new recordings have been made since 1985; that the mark is for a “concept group,” not a musical group; and that changes have been made to the design mark because of changes to certain of the characters depicted in the mark. Petitioner alleges that these changes amount to abandonment of all three marks without an intent to resume use. The USPTO Trademark Attorney refused Davide Mebane’s intent-to-use trademark application to register the Spoons Yogurt design mark on the Principal Register for “frozen yogurt” based on the likelihood of confusion with the previously registered Big Spoon Yogurt design trademark for “retail frozen dessert store services featuring frozen yogurt” under 15 U.S.C. §1052(d). 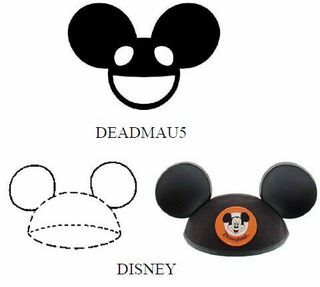 In any likelihood of confusion analysis, the Board considers the du Pont factors of (1) the similarity/dissimilarity of the trademarks, and (2) the similarities of the goods to be key. In re E. I. du Pont de Nemours & Co., 476 F.2d 1357, 177 USPQ 563 (CCPA 1973). Unfortunately for Applicant, he only discussed the similarity of the marks in his brief. 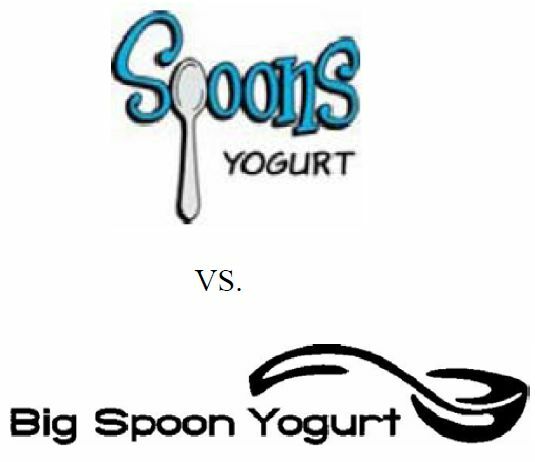 In considering the similarity of Applicant’s mark and the registered mark, the Board noted that it “has been consistently held that similarity in any one of the elements of sound, appearance or meaning is sufficient to support a finding of likelihood of confusion.” Thus, although the Board agreed with the Applicant that “Big Spoon” dominates in the registered trademark and the word portion – as opposed to the design – will leave more of an impression in the consumers mind, it disagreed that the term “spoon” is weak because of widespread use. online retail store services featuring jewelry boxes, jewelry findings, jewelry displays, jewelry repair kits, tools for making jewelry, beads, magnifiers, craft kits, crystals, and educational material, specifically books and various media, including instructional videos on the subject of jewelry (in International Class 35). In re Jewelry Supply, Inc., Serial No. 77475181 (May 4, 2011) [not precedential]. Applicant amended its application during prosecution to seek registration under Section 2(f) of the Trademark Act based on acquired descriptiveness. The Examining attorney, however, maintained the refusal because the evidence of acquired distinctiveness was insufficient. The sole issue on appeal was whether Applicant met its burden of establishing, by a preponderance of the evidence, that its trademark had acquired distinctiveness under Section 2(f). The Trademark Examining Attorney refused registration of Gardenlife, Inc.’s application for the trademark EZ GRO for “living flowers and plants and plant seeds” in light of the previously registered EEZY-GRO trademark for “flower pots and planters” under 15 U.S.C. §1052(d). The examining attorney also required a disclaimer of the word “GRO.” On appeal, applicant capitulated and included a disclaimer of the word “GRO.” As a procedural matter, the Board excluded materials attached to applicant’s brief from consideration on appeal because they were untimely under 37 C.F.R. § 2.142(d). Thus, the sole remaining issue on appeal was whether there was a likelihood of confusion between the two trademarks. We find the marks EZ GRO and EEZY-GRO substantially similar in terms of appearance, both comprised of two terms; the second in each being the identically misspelled word GRO (“grow”), the first in each being different fanciful spellings of the word “easy,” respectively EZ and EEZY. Although registrant’s mark contains two additional letters, they are not likely to be recognized and do not serve as distinguishing features because of their imbedded placement within the overall structure of registrant’s mark. In addition, and contrary to applicant’s contention, the hyphen in registrant’s mark is not a distinguishing feature and serves mainly as spacing between the two terms. See Goodyear Tire & Rubber Co. v. Dayco. Corp., 201 USPQ 485, 489 n.4 (TTAB 1978) (difference of hyphen insignificant). 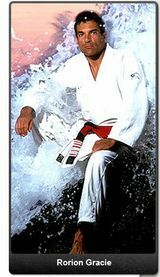 Los Angeles, CA – Rorion Gracie, the patriarch of the famed Gracie family from Brazil, filed a trademark infringement, Lanham Act § 43(a) unfair competition, and dilution lawsuit against Black Silver Enterprises and Un Mi Lee. Gracie is a 9th degree Red Belt in Brazilian Jiu-Jitsu and has been an owner of the “Gracie Jiu Jitsu” commercial endeavors since opening the first location in Southern California in 1978. In 1997, Plaintiff’s Gracie Gear trademark was registered with the USPTO for use on clothing and related merchandise. On September 20, 2005, Plaintiff received another registration for the mark Gracie for use on clothing. Ten days after the Gracie trademark registered, Defendant Black Silver filed an application with the USPTO to register its GRACIE mark for use on clothing. The USPTO issued an Office Action refusing to register Black Silver’s proposed mark due to a likelihood of confusion with Plaintiff’s registered trademarks. In October of 2006, Defendant filed petitions to cancel Plaintiff’s trademarks at the Trademark Trial and Appeal Board (“TTAB”), which proceedings are still continuing. Plaintiff alleges that in mid-2009 Defendants demanded payment of $250,000 as a license fee to use the Gracie trademark. As a result, Plaintiff filed the instant action. The case is Rorion Gracie v. Black Silver Enterprises, Inc. et al., CV 09-8273 GW (C.D. Cal. 2009). Los Angeles, CA – Nightclub promoter and performer Filthy McNasty – he legally changed his name – filed a trademark infringement lawsuit against Salon Corona, Inc. at the Los Angeles Federal District Court. Since 1980, Plaintiff McNasty has used the marks “FM Station Live” and “FM Station” for offering nightclub, live music and cabaret services. 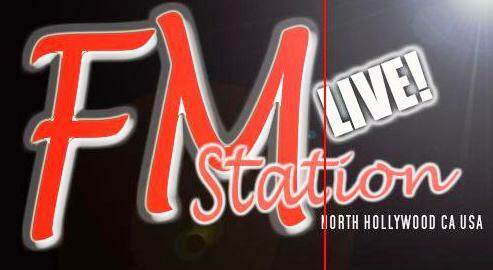 In 1989, the FM Station Live trademark was registered with the U.S. Patent & Trademark Office and has withstood a cancellation proceeding at the Trademark Trial and Appeal Board. 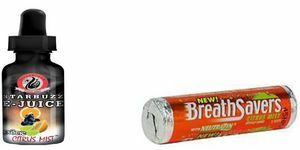 Click to read TTAB decision. The complaint alleges that Defendant Salon Corona and Shawn Crosby have infringed the FM Station trademark by operating a nightclub and live music venue in North Hollywood, California under an unauthorized “FM Station” live trademark. Plaintiff accuses the Defendants of intentionally infringing on his trademarks. Although not mentioned in the complaint, the TTAB sheds some light on the Defendants’ prior knowledge of the FM Station Live trademark. Plaintiff McNasty was promoting monthly shows at the Defendants’ location under the FM Station mark. The case is titled Filthy McNasty v. Shawn Crosby, et al., CV08-0695 RGK (C.D. Cal. 2008).